I didn’t feel really well today. Maybe, it was because a lot of thoughts such as final exam, homesick, boring, afraid, etc. Thus, maybe I felt really exhausted due to all-day-study-in-the-library things. Then, I promised myself not to study anymore when I got home. Anyway, one thing came to another I decided to watch a movie. 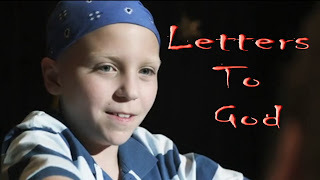 Yupe, as you can guess, the title is "Letter To God"
In short, this movie is telling us about how brave an 8 year old kid faced brain cancer and how he could change everybody's heart and feelings through his fate. And the most interesting part is this movie was a true story! I cried my eyes out since the beginning. (how embarrassing haha). Then, I looked back to my story; why was I sad? because it hard to get part time jobs, because I hate to study for my final exam, because I feel homesick..really really homesick (I was dreaming about coming backhome this winter break! huhu..). What are those things compare to an 8-year-old-kid-with-brain-cancer ?? And now I am feel so small. But not too long! Now I know what I have to do. In the end, something popped up on my mind. Maybe, God picked that movie for me to watch. He wanted to say to me that I am not alone. He will stays beside me, walk with me just like he did to Tyler (that 8 year old kid; I should said the name from the beginning, shouldn’t I? ). And He picked me, because I am the story teller (haha!). I am the one who can tell everybody that He is with me, through my blog! Last word (I promise). Hey Reader (gotcha! ), do feel lucky when you read this particular blog..hehe..
For you who have watched this movie: great movie huh?! For you who haven't watch it: I couldn't say anything but this is a great movie. For you who knew me and haven't watch this movie: ask me for free! hehe..
Let's open our hearts and let God do something on our lives. yeapp we hv to thank God that we're so blessed.. Nothing compares Him.... realy nice writing win.. Hope whoever read your writing will realize how great is our God..